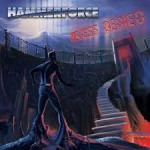 Share the post "Album review: HAMMERFORCE – Access Denied"
A bit of synth driven power metal from St Petersburg this time. Hammerforce formed back in 2006 and this is the band’s second album, the first being ‘Dice’ released back in 2009. On first listen I wasn’t too sure what to make of this album. The lead in all tracks is taken by the synth work of Nikita Merzlyakov which is first rate but gives the album a slightly dated feel, as if you have slipped back into the 80’s. On further listens you can appreciate the fine guitar work in evidence and the album begins to make more sense. Power metal with a prog edge is the band’s forte and they can indeed play it well. There are some good tracks here, again I couldn’t help but think I had heard it all before and possible done a lot better. That’s not to say that Hammerforce are a bad band, because they have a lot going for them, but ultimately their songwriting and style lets them down. This entry was posted in ALBUM REVIEWS, ALBUM REVIEWS (Mobile), All Posts, PURE METAL (All posts), Pure Metal/Album reviews and tagged Access Denied, album, CD, Hammerforce, power metal, prog, progressive, review, rock, Russia. Bookmark the permalink.